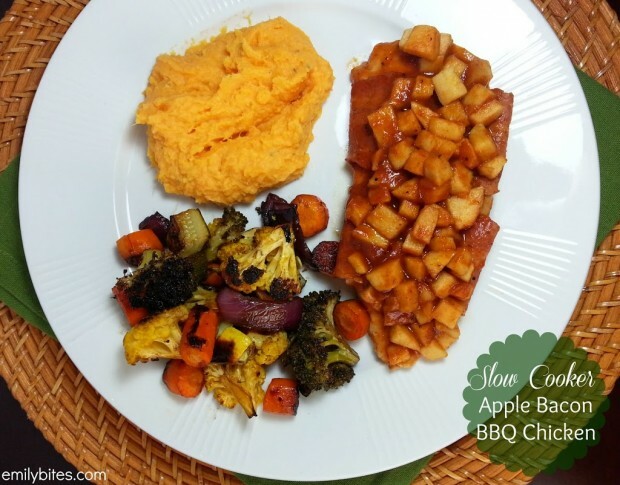 I’m always on the lookout for simple and delicious slow cooker recipes and when I found this one I was really excited. Apples and bacon and barbecue? On chicken? Oh my. The flavors did not disappoint. This dish is equal parts sweet and tart from the apples, tangy and spicy from the barbecue sauce and smoky from the bacon. It’s a warm, comforting dish for Fall and it pairs really well with Goat Cheese Mashed Sweet Potatoes and Balsamic Roasted Vegetables (pictured). I had my parents over for dinner last weekend and I made this, fingers crossed, without having tried it first and it was a huge hit. The best part is that it takes only a few minutes in the morning and then dinner is done when you’re ready to eat. It can be difficult to motivate to cook after work this time of year when it’s starting to get dark by the time you leave, so it’s always a relief to arrive home and know dinner is already made! Bring a skillet over medium heat and cook the bacon for a few minutes on each side until it starts to slightly crisp but is still bendable enough to wrap around chicken. 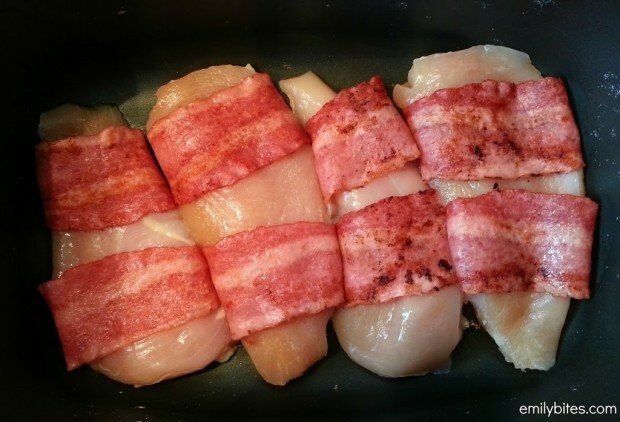 Wrap two slices of bacon around each chicken breast and place the breasts bacon seam-side down in your slow cooker. In a large bowl, mix the barbecue sauce, apples and lemon juice until thoroughly combined. Pour the mixture over the top of the chicken in the slow cooker and cover. Cook on low for 8 hours. what about baking this in the oven? would you say like 350 for an hour or hour and a half? If you were to cook on high, how long do you think? What are those side dishes? They look AMAZING as well! I’m sooo making this! This looks like a recipe even the kids will love! The tend to like chicken thighs more, so I think I’ll throw in a couple for them. Thanks for all of your recipes. This will be “what’s for Dinner” tomorrow. Such a simple Idea and looks delicious. I wish I had the knack for putting these combos together to make something great. Thanks for your ideas…..keep them coming because this mom needs all the help she can get in the kitchen. I love my slow cooker. In fact I won two of them and often times have both going at the same time! This looks amazing. Thanks. I tried today in the oven, except with pork bacon and double bacon then. Delicious, used also Stubb’s original, but a bit heavy on that. 150° Celsius for one hour, the first 40mins covered with aluminium foil in a glass bowl, the rest of the time without the cover. I made this on Monday without the bacon. I doubled the recipe and ended up shredding the chicken. It was delicious! I followed your recipe to the letter and it turned out wonderful. My family and even my little nephews thought they were great! They even asked if we could have them again this week! This was easy and quick to make. I will definitely make this recipe again. Thanks so much! This is in the slow cooker right now! I increased the recipe by half for leftovers. Thank you for another great recipe! I’m not a big fan of sweet potatoes. What other starchy sides would you suggest? I can’t wait to try this one! I am replacing the apple with canned chunk pinapple in its own juice! I think it will be yummy! WOW another great recipe!!! I Didn’t have bbq sauce so I made my own- 50/50 ketchup and HP mixed with 2 tbs of brown sugar. This is sooo good! Thanks for another hit dinner night Em! Making this for dinner tonight, can’t WAIT to see how it turns out!! What size slow cooker are you using when making this? I made this recipe tonight using a 6 quart slow cooker and the chicken came out slightly dry and the sauce was slightly burnt, but it was still good. Would you recommend cooking this for less time? This was soooo yummy! We made the mashed sweet potatoes too, but I used ricotta cheese instead. You are the new favorite person in our house! I am doing Weight Watchers; my husband is not. However, he is enjoying the benefits of me being on the program, because he tends to lose weight too with me cooking healthier foods. Everything looks so delicious, we have decided to try at least 2-3 new recipes each week. THANK YOU!!!! Ahhh-Mazing!! I made this last night and it is wonderful!! Do I thaw the chicken first?